The World Flying Disc Federation is noticeably using Men's when referring to what has been historically been called the "Open" Division. USA Ultimate renamed the Open division to the Men's division in 2013 to coincide with the launch of their Triple Crown Tour. 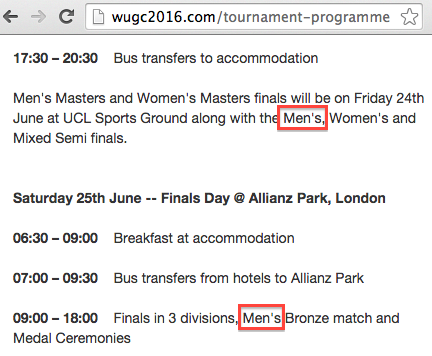 Regardless of what the division is called, the "Men's" Division is still considered an open division which has "no gender restrictions," according to WFDF's 2016 World Ultimate and Guts Championships WUGC event site. RISE UP has organized a 1-day, in-person conference for ultimate coaches and leaders. Info: One-day conference to empower leaders with tools and experience to improve their confidence and grow their programs. Presentation topics include: Team Culture and Dynamics, Program Development, Skill and Strategy Development, Season and Practice Planning, Youth Development from presenters like Ren Caldwell, Frank Nam, Dr. Ben Wiggins and Melissa Witmer. Equity Goal #1: Support women's ultimate. Registration priority will be given to coaches who are women or those who coach women/girls. Equity Goal #2: Provide easy access to coaches who serve disadvantaged Seattle communities. Conference located in South Seattle, and registration priority will be given. Dr. Tom Crawford, Chief Executive Officer of USA Ultimate, has earned a 6-year extension on his contract, according to USAU. Crawford first joined USAU in 2009. Crawford leads a staff of 18 at the non-profit's headquarters in Colorado Springs. Crawford is quoted in the news story as saying: "As I've said many times, I fell in love with ultimate as a unique, wicked fun and highly athletic sport. I love the Spirit of the Game ethos, and unlike other sports that talk about and even emphasize sportsmanship, ultimate has found a way to truly operationalize it, so it sticks and becomes part of the fabric of the sport, and I love that. It makes this sport very different from most other sports, and I'm energized to be sure families learn about it as a great option for their children. And I want to put our world class athletes on the big stage. Thus I am thrilled and truly honored that the board is pleased enough with my leadership and performance to offer me this long term agreement that allows me to continue to lead the smartest staff I've ever had the pleasure to work with and to lead the growth of ultimate and this organization for years to come. We've got some really exciting plans, and I'm truly psyched about our future!" Ranging from athletic to crude, these digital stickers provide a glimpse of (possible) future emojis for depicting ultimate. The following are a few standout "stickers" for use in the LINE mobile messenger app. View all 40 digital stickers at the LINE Store. Now, we wait until the WhatsApp Messenger founders add these emojis for their popular app. Info: Geared towards women of all skill levels and will be run hat tourney style! Each team, captained by Scandal and Backhanded players, will play four, 30-minute rounds of 4v4 ultimate. 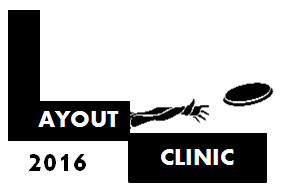 During a team's bye round, Scandal and Backhanded players will facilitate the layout clinic, walking participants through the basics of laying out and working up to a full form biiiiiiiiid. Price: $15 per person, $20 at the door. Register online. Skip Sewell discussed the new organization organizing goaltimate on Ultiworld's Deep Look [January 26, 2016 episode] podcast. Sewell: "Goaltimate is essentially the half-court basketball of ultimate Frisbee...involves a hoop - an arc that you throw the disc through (that's how you score). It's 4-on-4; 5-second stall count. It's a much faster, much more portable game than ultimate." To be honest, portability has never crossed my mind in defining a field sport. Is the comparison setting up 8 cones for an ultimate field versus erecting the goaltimate kit? 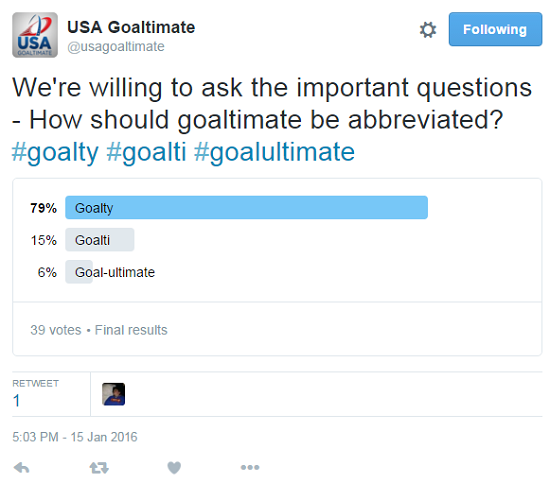 Earlier in the month, USAG conducted a Twitter poll on abbreviation preferences of goaltimate. The survey results should not shock you. Nearly 8 out of 10 respondents chose "goalty" over the other 2 choices - goalti (nuh-uh) and goal-ultimate (not a chance). For the record, "goal-ultimate" is not an abbreviation. 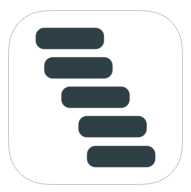 More specifically, Stack (the iOS app). 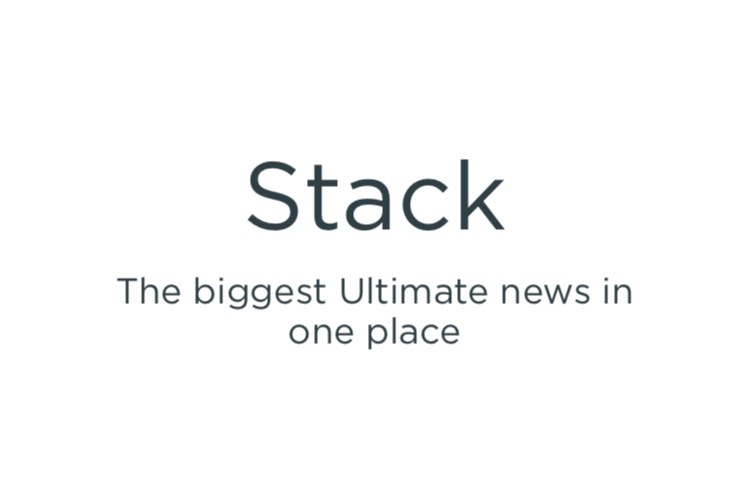 Info: Stack is the one place on iOS to get all of your ultimate news created by Brad Smith. Read articles from the biggest sources including Skyd, Ultiworld, AUDL, MLU, and others. 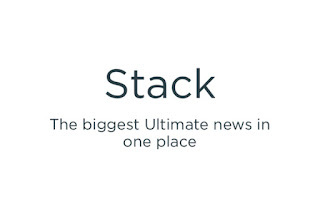 This SLUDGE blog is lumped in with "others" and promoted on a list of "biggest content providers" of ultimate news. When in snow, do as the snowman would do. It's like the most beautiful snowflake in the world. 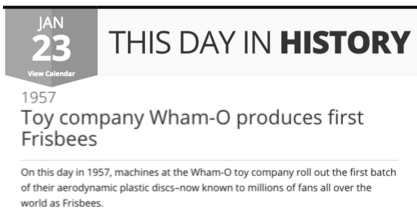 According to the History Channel, on this day (January 23) in 1957, "Toy company Wham-O produces first Frisbees." Hey, this blog supports having an annual day to celebrate the invention of the disc that made the sport of ultimate possible. But, let's be clear that January 23rd was not chosen because of what one source allegedly says happened today in 1957. This blog is always looking at an opportunity to celebrate the disc, but not at the expense of revising history. January 23rd works well, plus it's easy to remember...1/23. 1. In 1957, Whamo-O was known as Wamo (no "h," no hyphen) Manufacturing Company. 2. The flying plastic disc was called "Pluto Platter" in 1957 and later renamed "Frisbee" in 1958. 3. The disc shown rolling as a transition during the history lesson's video portion is not a Frisbee(R); it's a Discraft Ultra-Star. 4. There is no citation listed on this event of machines rolling out a first batch of discs - even when asked. Moreover, I contacted History via their support link on their website in 2015. No reply. No update. Honestly, it's highly unlikely that Wamo (Wham-O) a small toy company in the late 1950's executed this contract AND started production of the toy. Perhaps a 21st Century toy corporation could/would do that. So what actually happened on the 23rd day of January in 1957? Here is actual evidence of what occurred on January 23, 1957, regarding a plastic toy that became the Frisbee and the company that would later be known as Wham-O. wanna Netflix and Wind Chill? 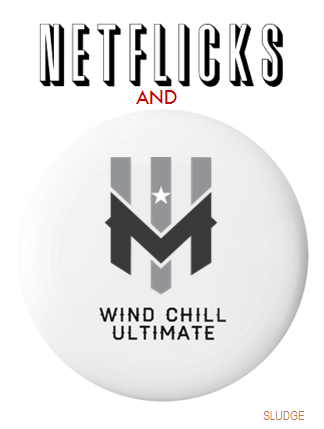 The Minnesota AUDL team could name their online highlight videos as Netflicks and Wind Chill. 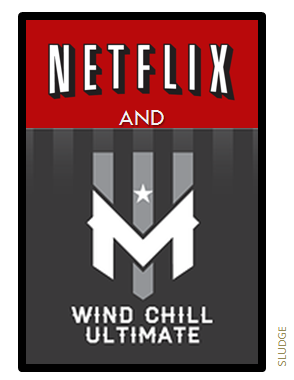 Ya know because "Netflix" would be an apt company name for a service offering on-demand ultimate highlight videos. 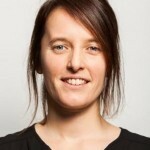 In October 2015, Montreal Royal announced Guylaine Girard as their Head Coach [entraîneure-chef] for the upcoming 2016 American Ultimate Disc League (AUDL) season. Girard was an assistant coach for the AUDL team in 2015 with a specialization in "mental preparation." The Royal went (9-5) in the 2015 regular season, which earned them a playoff spot in the East Division. Girard is also a captain of Vintage, the 2014 world champion Women's Masters club ultimate team based out of Montreal. With this promotion by the Montreal Royal, Guylaine Girard becomes the first full-time female head ultimate coach in a pro ultimate league. Félicitations, Guylaine! Montreal has a penchant of being pioneers. RELATED: Sarah Itoh's coaching win . Jessi Jones rostering . What is the exact size for a beach ultimate field? I'm not shore because, well, it depends on whether you have adopted the metric system. 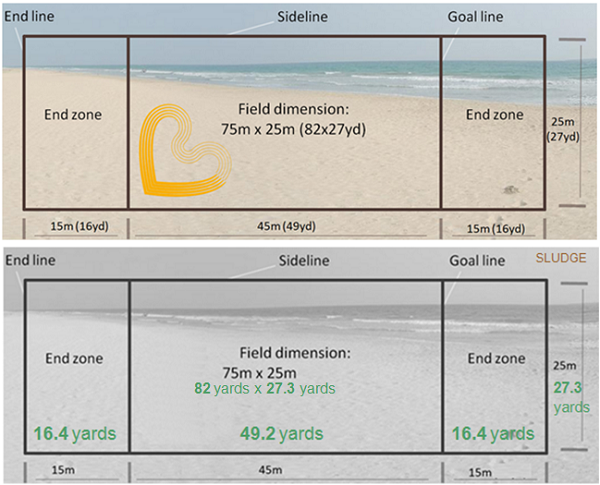 If following BULA's specs (meters), the beach ultimate in yards would be slightly skinnier, and slightly smaller playing field with end zones that are short by more than 1 yard. In general, an extra 0.3 yard (or 10.8 inches) is not quite one foot, but it could be enough of a player's foot. Any extra space on the beach ulti field would be significant when playing beach ultimate as that additional field space could be the difference between in and out. Here's a real-life example of possible confusion: Lei-Out announced their beach field size matched regulation field size (25 x 45 + 15 end zones), which is correct only IF those figures are in meters; not yards. Lei-Out was played in Santa Monica, California. 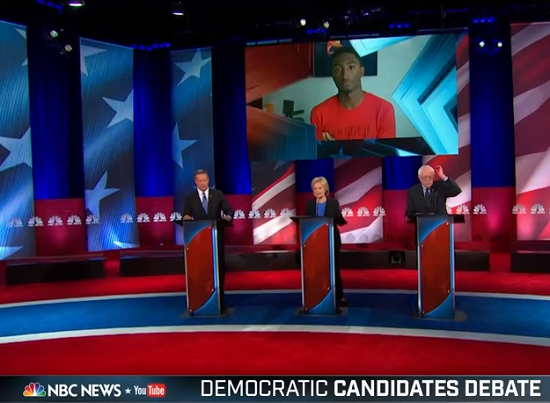 Marques Brownlee [@MKBHD] - "side hustles: He also plays ultimate, as in Frisbee" - posed a question at Sunday's Democratic presidential debate between Hillary Rodham Clinton, Bernie Sanders and Martin O'Malley. Jump to 14:50 to hear MKBHD's query on best perspective...regarding technological privacy and security. Shockingly, MKBHD was not - I repeat - not wearing any ultimate swag. When borrowing an item at an ultimate game turns into a life enrichment product. 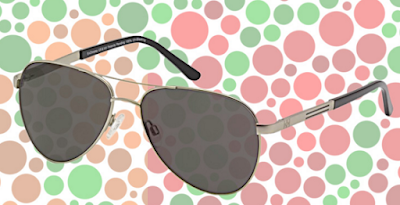 The EnChroma glasses help correct for some forms of mild colorblindness. Don McPherson, creator of the glasses, said they are based on a product he designed years ago to protect surgeons' eyes from the lasers they use in the operating room. He found out that the shades were disappearing from the hospital — surgeons liked them, he said, and were taking them home. So he decided to take home a pair, too. At an Ultimate Frisbee tournament a short time later, a friend (Michael Angell) who is colorblind asked to borrow McPherson’s glasses. "He said, 'Oh, my God, I can see the cones,' and he was referring to the fluorescent orange marker cones that delineate the perimeter of a playing field," McPherson said. “And I said, 'That's crazy — you can't see the cones normally?' and he said, 'No, the grass and the cones are the same shade of brown.'" Via Smithsonian Magazine: It wasn't until Angell borrowed his sunglasses at the Frisbee game, however, that McPherson realized they could serve a broader purpose and help those who are colorblind. This recent comic showing angels in heaven tossing their halo as if it were a Frisbee is reminiscent of this heavenly comic. Angel (watching 2 angels trying to catch a thrown halo): "Things have really picked up since ultimate caught on." Could this be interpreted that more ultimate players are going to heaven since the sport has become popular? Discraft's ubiquitous plastic flying disc got a SuperColor makeover which covers the entire face of the ultimate disc. 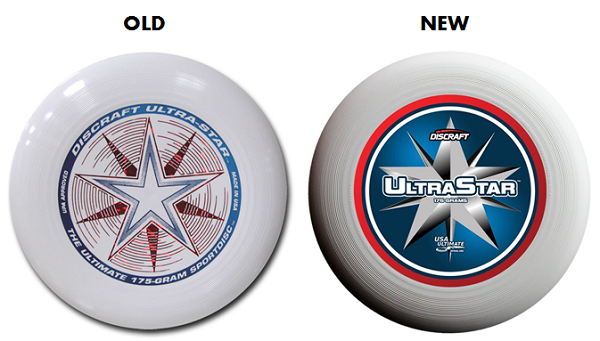 Beyond the design update, you will notice the disc name has officially changed from "Ultra-Star" to "UltraStar" - a change implemented in 2014. 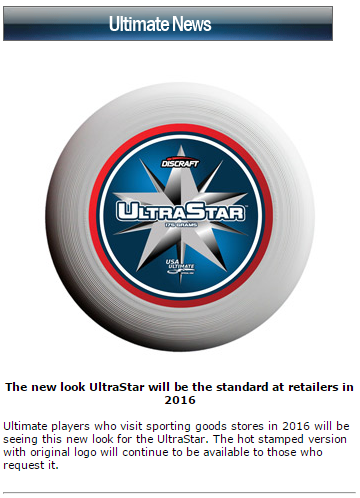 Discraft's logo and USA Ultimate's logo will now appear on the discs along with its weight. 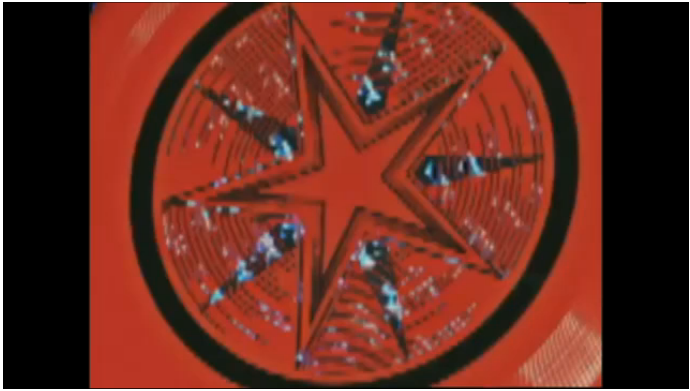 For those counting at home, that's 2 logo'd discs on the disc itself. Per their website: "The hot stamped version with original logo will continue to be available to those who request it." BREAKING: Ultimate Frisbee to be renamed to PowerFlatball in an attempt to increase interest in the sport. Powerball is huge right now! So, it makes sense to completely embrace this change for the better. Hopefully, ticket sales to ultimate games will one day match the popularity of Powerball. 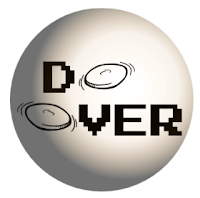 Powerball's January 13th drawing is estimated at $1.5 billion! 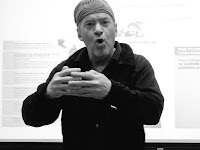 Yet another venture from Skip Sewell Productions! USA Goaltimate (www.usagoaltimate.org) launched and already boasts a team of 10 including Colin McIntyre (USA Ultimate's Standing Rules Committee Chair), (Liam Rosen (Sky'd new Editor in Chief), Claire Chastain (USAU National Youth Outreach Director), and Heather Ann Brauer (USA Ultimate National Girls' Outreach Director). USAG's mission as the national governing body for the sport of goaltimate, is to create goaltimate playing opportunities for all levels of play and to support the growth of the game through resources, outreach, and education. 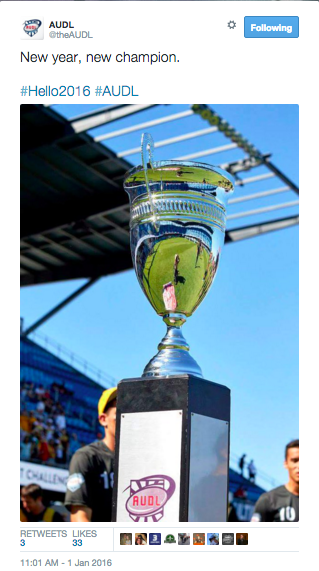 A 2016 USA Goaltimate Championship Series is already scheduled. Western Conference Championship: San Francisco, CA on March 26-27. 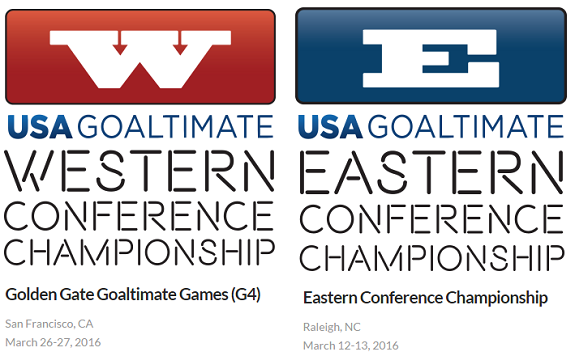 Eastern Conference Championship: Raleigh, NC on March 12-13. 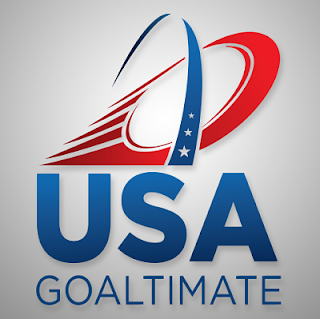 We have always been fans of goalty and hope goaltimate becomes more ingrained with ultimate events. Elliot Trotter, Skyd Magazine's Editor-in-Chief, for the past five years announced he is stepping down as of Friday, January 8. Trotter plans to remain with the ultimate media company (Skyd LLC) as an advisor. Liam Rosen - a co-founder of the site - will now take over as the Skyd's Editor-in-Chief. Congratulations to Elliot for realizing his dream to create an outlet for ultimate. There's so much to be proud of which has benefited and will continue to benefit the sport of ultimate. 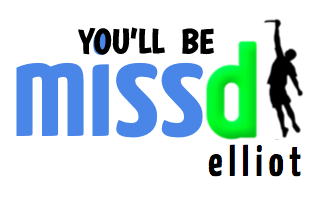 Elliot Trotter will be missed. Glad to know he will remain involved with Skyd. NOTES: This is not intended to be list EVERY ultimate event in 2015, just some major ones. Will update as additional dates are published. 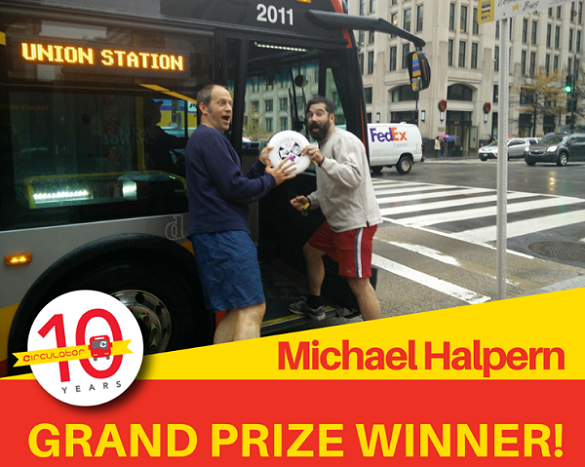 The grand prize winner of DC Circulator's #RidePlayWin Photo Contest celebrating its 10th anniversary was just announced. The winning photo shows 2 ultimate players holding a Washington Area Frisbee Club disc as they board the DC Circulator bus toward Union Station. "My friend Stephen and I entered the contest together, and contacted everyone we could — our families, our soup cooperative, even our ultimate Frisbee team," said Halpern. "It was a true team effort." The grand prize winner was selected by earning the most "likes" across all owned photo submissions uploaded to the DC Circulator page. The winner needed to submit at least three daily photo entries to qualify for the grand prize. The D.C. Breeze have been busy bolstering their roster for the 2016 AUDL season. 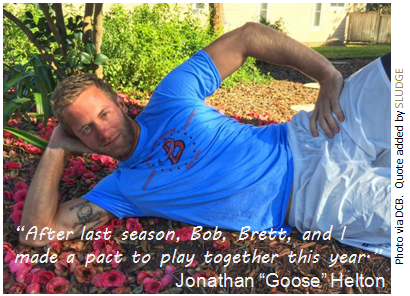 Breeze bring back Andrew Allen, sign Nate Castine, and welcome three players who played on the Chicago Wildfire in 2015 - Bob Liu, Jonathan "Goose" Helton, and Brett Matzuka. Per Ultiworld, Helton and Liu will be moving to and working in Ocean City, Maryland (150 miles away from D.C.) which is ~3 hours away from the District if bridge traffic ain't bad. As a comparison, Philadelphia is just as close to Ocean City. Another interesting aspect to this group signing is Helton's reference to the three out-of-towners, "After last season, Bob, Brett, and I made a pact to play together this year." My suggestion for this 3-person pact is Goose-Liu-'zuka Pact™. Brett Matzuka, who usually wears jersey number 45, is currently without number since #45 has already taken by Jeff Wodatch. (In 2015, Seth Collins wore #45 for the DC Breeze.) Matzuka started playing ultimate with #00 (Goose's eponymous number). Expect him to eventually choose either #44 or #47. "I am truly excited to rejoin the DC Breeze and contribute however I can in the future success! When you get a chance to play alongside Alan 'McDreamyLocks' Kolick, Nate 'Fat Nate' Castine, Jonathan 'the hand' Neeley, Jeff 'you have my number' Wodatch, Nicky 'the face' Spiva, David 'no nickname' Cranston, and a wealth of other great players, what more can you want!? Playing alongside my close friends from team’s past including Bob Liu and Jonathan Helton is just icing on the cake. I look forward to getting the DC Breeze back on top of the league in terms of high fives; let the prairie dog pack continue to thrive!" UPDATE: Brett Matzuka has chosen #54. According to Sin The Fields podcast [December 31, 2015 episode], the selection process of Pittsburgh's co-ed ultimate team — Muff'n Men — is underway. 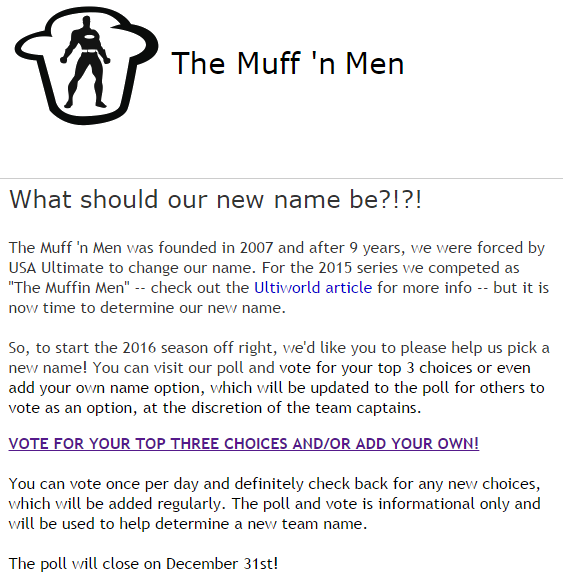 The team played as "Muff'n Men" since its founding in 2007, but the mixed division team was forced to change their name by USA Ultimate for the Triple Crown tour 2015 season. 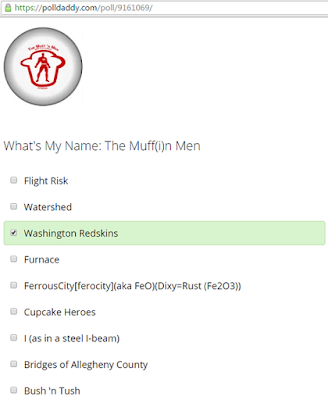 "Washington Redskins" with 6 total votes. Patrick Stegemoeller, co-host of STF, labeled the DC NFL football team choice as "Andy Kaufman-level." Co-host Tad Wissel dared the Pittsburgh ultimate team to "do the right thing." While some politicians have publicly opined that the Washington professional football team should change the name, it's clear the name change remains a hot button issue for the NFL team. States are even taking measures to forbid the use of Native American names as mascots. 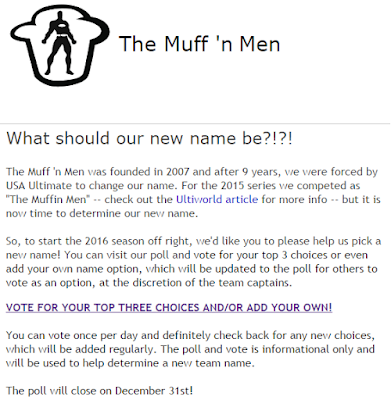 See below for The Muff 'n Men's team name poll introduction and a disclaimer that votes are "informational only and will be used to help determine a new team name." Every ultimate player can appreciate their other sport's cleats to play our sport. Seattle's AUDL team, Cascades, announced a partnership with the men's club ultimate team, Sockeye. The cooperation net goes beyond the playing roster by capturing coaches, too. Per the announcement: "Sockeye and Cascades will share the same captains and coaching staff. Most of the players who join the Cascades will transition to Sockeye in June, after which the two rosters will be fairly similar. Throughout the entire season, [General Manager] Xtehn will work closely with the Sockeye leadership to plan and execute roster decisions, fitness planning, and on field practices. " 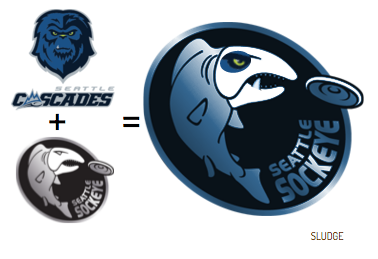 A similar partnership between Seattle Cascades and Seattle Sockeye happened in 2015. The American Ultimate Disc League started the new calendar year by dissing one of the most successful teams in its history. New year? Yes. Happy 2016! New champions? 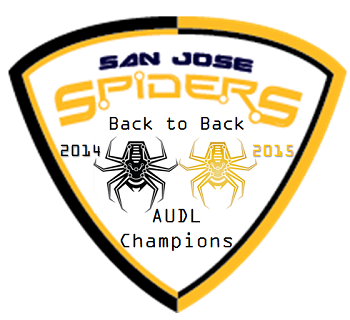 Well, the (repeat champions) San Jose Spiders might have an opinion about that. What started with a Star Wars connection with the New York Empire grew into a plethora of logo mashups with AUDL teams. 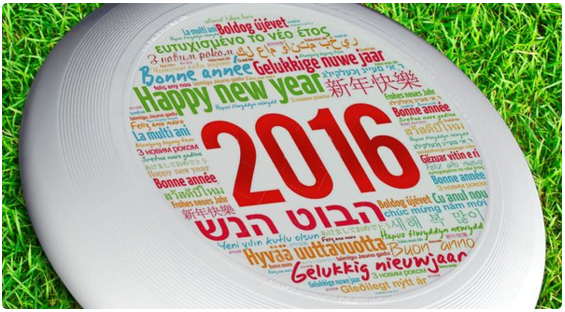 Have a happy 2016 on and off the field!